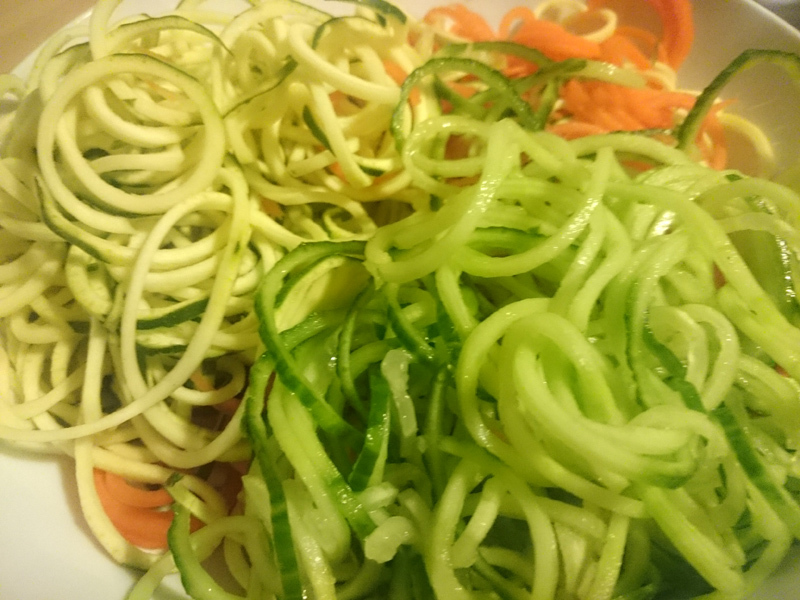 Spiralizing. 5 years ago you may have thought this was some sort of space term or something you'd get done down the hairdressers. But certainly in 2015, spiralizing has become huge thanks for lots of pretty bloggers like Deliciously Ella or the Hemsley + Hemsley girls. I've dabbled with it myself, and not wanting another bulky kitchen item got one of the pencil sharpener style spiralizers instead of the big crank wheel versions. And to be fair it was a pain in a backside to use and resides in the back of my kitchen cupboard. So when OXO Good Grips released a compact one, I thought there was no brand better to nail this. 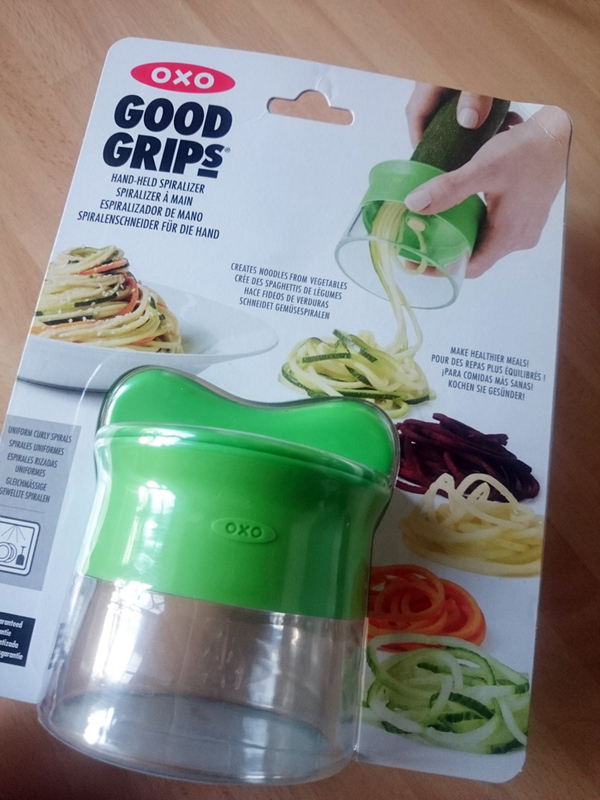 It's like a pencil sharpener style spiralizer but in OXO Good Grip style, it's been better designed, far more ergonomic and generally easier to use. 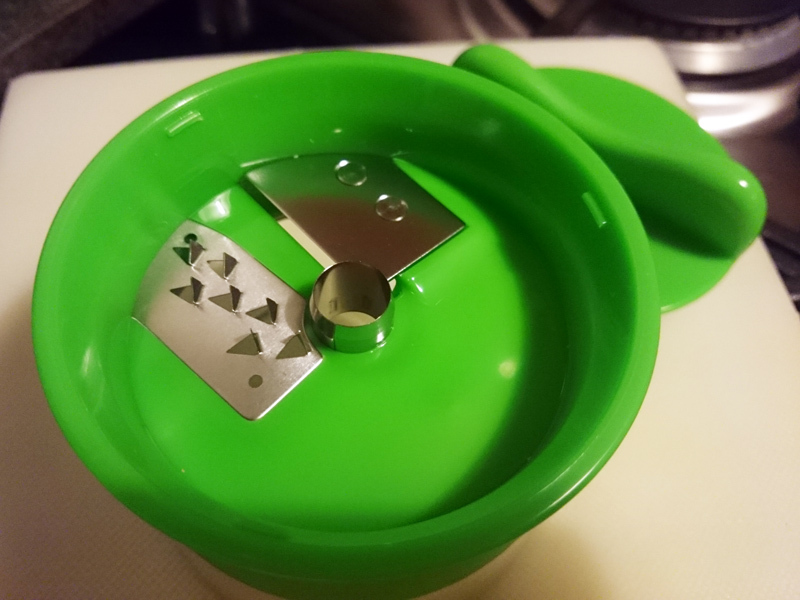 The blades are really sharp and as they are on a single level (unlike the sharpener style) it's far easier to clean. I found it zipped quickly through cucumber and courgettes, producing spiralized strand so long and even they had to be trimmed. It was easy to hold and I didn't actually need the finger guard. You still get the little bit of waste from the core it produces but I'd consider that chef's treat to munch on rather than throw. I did however struggle with carrots. I couldn't produce a strand from them, just short curls. On the whole I think I will use it for courgettes and cucumbers and it has been handy to get more veg into my toddler from a novelty point of view, which for any parent is a huge bonus. 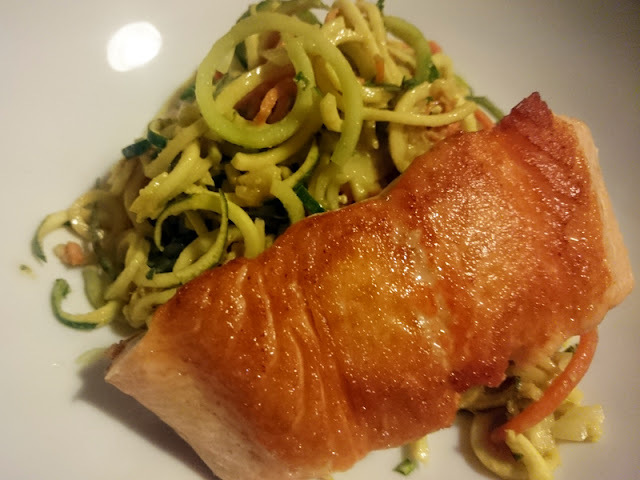 Although I won't be replacing spaghetti with (urgh, I can't even say it) "courgetti" any time soon, I loved the fresh courgette and cucumber salad with tahini sauce I made for dinner with some simple pan fried salmon (recipe below). Personally, I don't see spiralizing as a replacement for anything (carb lover 4eva) but as a useful addition to my food prep. For the speed I can now knock up a really quick salad that's a little more interesting or whizz through a potato for a crunchy rosti or a quick slaw side. Preparing vegetables in an alternative way makes such a difference to your enjoyment of them. I'd say this is a great tool to have if you are wanting to try out spiralizing or you prepare meals for just one or two of you. 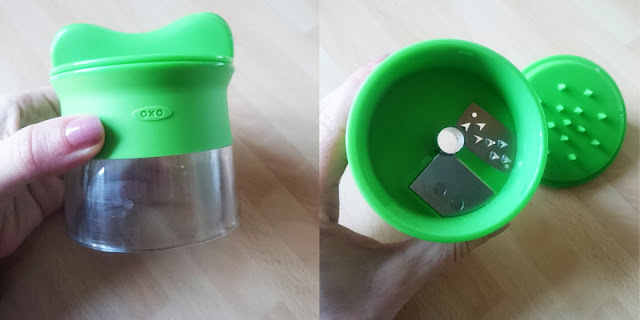 You certainly don't want to prepare for a crowd or large volume with this as you have to twist the veg around and would be hard work, but for my needs, this is a perfect little tool. Whisk together the sesame oil and tahini, soy sauce, ginger, vinegar and tabasco in a large bowl. Thin the sauce with hot water until it’s about the consistency of heavy cream. Toss the spiralized courgette and cucumber “noodles” with the sauce. Taste and adjust the seasonings (the dish may need salt), then garnish with the carrot, onions, and sesame seeds and serve. I was sent this product for review. Words and thoughts, as always, my own.